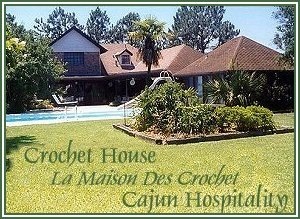 The Crochet House is located 1 hour from New Orleans Airport and a few blocks from the new Houma Civic Center. Turn right on Hwy 61 until you reach Hwy 310 Boutte-Luting. You will reach Hwy 90; turn right to Houma. There are 4 exits when you reach Houma (Hwy 182 and Hwy 316). The third exit is Hwy 24 and the 4th exit is Hwy 311. Either one of these 2 exits you will turn left on, heading south towards Houma. Approximately 15 minutes down you will reach St. Charles St., where you will turn right, following down until you reach Summerfield Dr. At Summerfield Dr turn left. Go 2 blocks down and on the third block, it's the first house on the right.